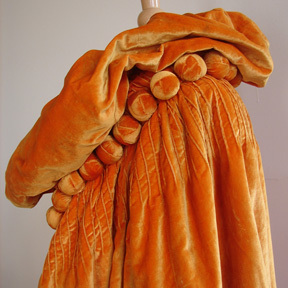 A very beautiful and rich velvet cape by "Bournes & Hollingworth of London". The lush texture of the velvet is enhanced by the highly decorative array of stitching and large velvet covered bobbles that surround the collar. This cape absolutely glows! A perfect item for evening wear. Good condition, a couple of dark marks need to be spot cleaned. 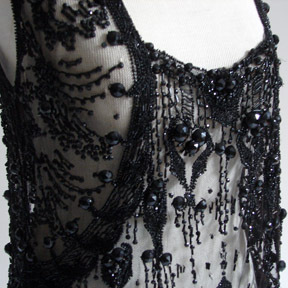 Circa aearly 1900's, a fine and lovely black net tabard dress with a beautiful design. 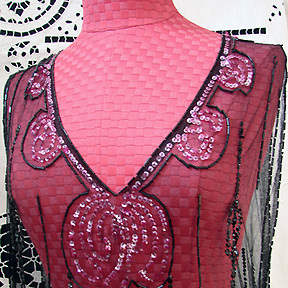 The combination of rose-pink sequins, black sequins, and bulge beads is quite elegant. A very wearable dress! Circa 1900, quite a dazzling Edwardian net bodice with an amazing array of elaborate jet beads that are different sizes and shapes. Measuring appr. 26" long but tapering lower at the front, apprx. 22-24" across chestline, and almost 9" across armhole. A beautiful item! Glowing cream silk and heavily embroidered canton silk coat in near mint condition. The coat is encrusted with birds, flowers, and meandering vines and leaves. Measuring apprx. 40" long, 9 1/2-10" across armhole, 12" on each side panel. Inner lining has two small red spots and 3-4 tiny age marks. The coat itself is in excellent condition. 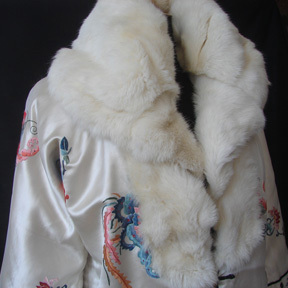 Circa 1920-40's, a magnificent silk embroidered coat that is completely lined with fur. 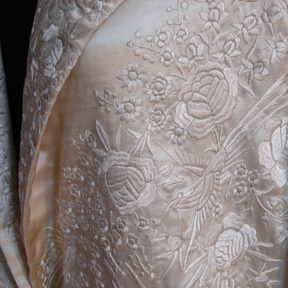 The silk has a luminous and pearlescent glow. The palette is gentle and the opulance of the fur provides the perfect compliment to this superb coat. Exquisite workmanship and design are the hallmarks on this wearable and stylish coat.